A volunteer practices falconry with an eagle. 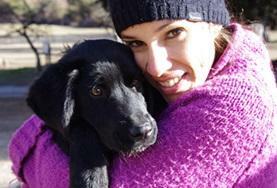 If you’re part of a group passionate about working with animals this is the option for you. Your school or university group can set forth on a meaningful travel adventure, assisting at an animal care or veterinary centre. Enjoy a life-changing experience volunteering at poorly resourced centres which could really benefit from your help. You might be working with giraffes in Kenya, turtles or crocodiles in Mexico or with cats and dogs in South Africa. 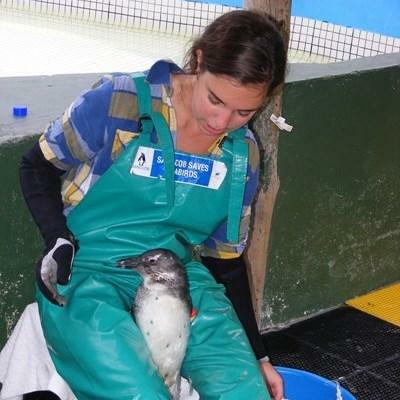 A volunteer on her gap year holds a penguin at a seabird conservation centre in South Africa. You and your group will be working together to assist the local staff. It is a great opportunity if you’re planning to work in veterinary or animal care as a career or just want to help out with animals at a centre which needs an extra pair of hands. You can get real hands-on experience whether you’re feeding cats and dogs at an animal shelter or mucking out stables at an equine centre or monkey sanctuary. This group volunteering project can be combined with other projects so that you could combine working at an animal care centre with working with young people in a care centre or helping on a community building project. If you want to combine projects get in touch and find out what you can do. You can call us on 01903 708316 or email us at groups@projects-abroad.co.uk and we can put together a provisional itinerary for you. Projects Abroad have animal care projects available in Argentina, Ghana, Mexico (conservation), Romania and South Africa.